Paintings from Russia and other Places. Travels with a portable paintbox following the evolution of plein air painting. This exhibition showcases the plein air paintings of a young Glasgow artist David Caldwell, giving him the opportunity to express his deeply personal response to the wonders of the landscape around him. He takes us on an insightful journey through Scotland, France and Russia. His paintings convey the magical quality of the constantly differing light and its effects on the landscape in which he works, reflecting the process of continual change. 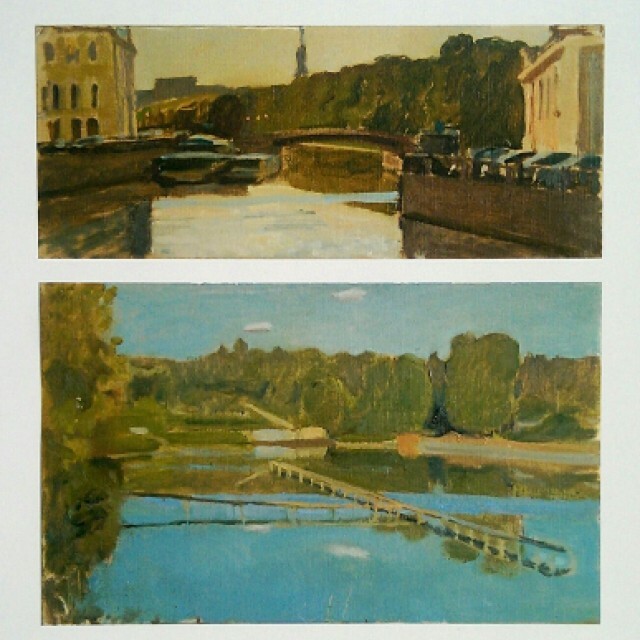 In a historical significance to this visual inquiry, Caldwell feels he is following literally in the foot steps of the great plein air painters to Collioure in the south of France where Matisse and Derain famously embarked on Fauvism, and to Russia, Plyos - a favourite spot of the great landscape painter Levitan. Caldwell cites the work of Corot, Constable and Cezanne but brings his own individual style and vision into his painting. He studied Drawing and Painting at Glasgow School of Art and The Prince's Drawing School, London. Caldwell is a winner of the 'Bulldog Bursary' awarded by The Royal Society of Portrait Painters.